Oh My Goat is an action-packed platformer full of tight jumps where quick reflexes are crucial. Each level is composed of 12 screens that you'll have to complete with the least possible number of deaths in order to get the highest score. Each world introduces new physics, environments and game mechanics, allowing our four-hooved horned hero to jump differently. Gameplay remains fresh with very simple and intuitive controls. Hi there! 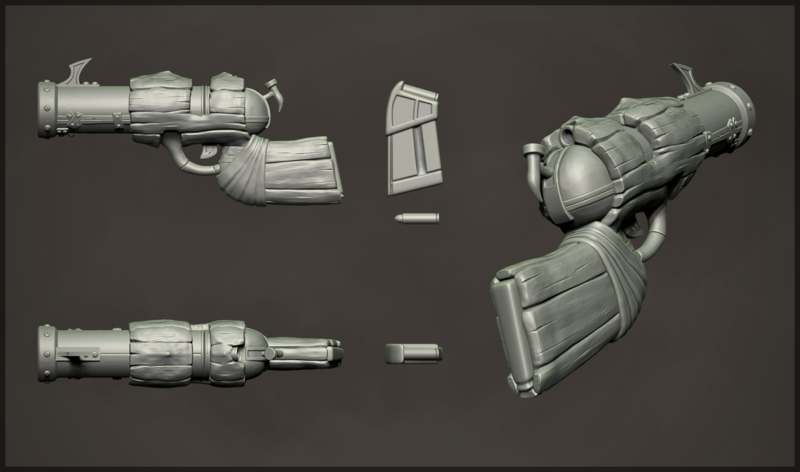 I'm Bruno, Community Manager of CremaGames, and today I want to tell you a little more about the guns of Immortal Redneck, those bulky, silly and really dangerous tools you'll use to kill demons, ancient creatures and those big bosses we have already told you about. If you have followed us, you'll probably know about the handgun, aka Grandpa. Today I'll go a little further into detail about it and I'll also be showing two more weapons: the shotgun and the dynamite sticks. Our 3D artists and animators have been working really hard lately so I can tell you more about all this stuff. I mean, we almost had to tie them to their tables so they were ready for today's devlog, but it was worth it. I'm joking of course, but you get the idea: nailing a gun's animation is always complicated. There are a lot of little parts and mechanisms working together, and even if they are fantastic, impossible weapons, they need some logic that supports all of that. I'm sure you already know the tragic story behind the redneck's dear handgun, Grandpa. 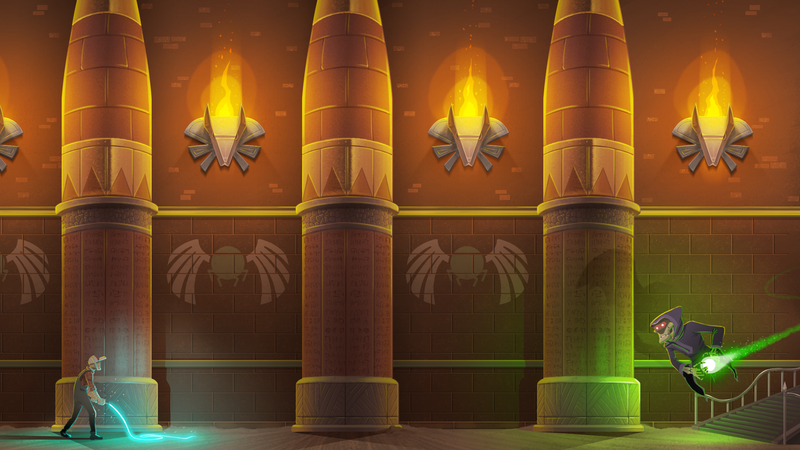 But if you haven't read about it in our previous devlog, you can take a guess about it origins... Anyway, the handgun has a strong recoil, but it's a powerful weapon. We are not sure about the size of the magazine just yet, but there will probably be around 10 or 12 bullets. It's design is really rudimentary, but that's intentional. The redneck is a wacky fellow kidnapped by strange powers, so his handgun had to be both silly and impossible, but it had to look plausible. The way it's hold, the way you reload it and its hammer are plain stupid, but it all works like a real handgun. Even if our animations are simple, every frame is special to us and we need everything to work together. So yeah: silly gun, clever concept. We had to check that the behaviour we programmed in Unity was working as intended and that the shooting, the damage and all that stuff we'll use in other guns was working okay. That took a little time. This is a 3D model so you can enjoy all the sides of our gun and we can save making a lot of screenshots. And this is how the gun shoots and reloads. Take notice of the crosshair opening a little when running and after each shot. Now, something new: the shotgun, also known as Mr. Tickles. We know the name is weird, but it's the redneck's choice, not ours. It seems one of his first memories of our friend is about his father, his mother and their old cow, Betty. He remembers that one night, his pop thought it was a good idea to take Betty into the kitchen to serve himself a fresh glass of milk, but the evening ended with his mom using the shotgun on the poor animal once it panicked and knocked his father out. When the noise attracted our little, innocent redneck to the kitchen and he saw the scene, his mom told him that Betty was ok, just resting because she laughed too hard when she 'tickled' the cow with Mr. Tickles. Also, that his father was a [censored] drunk. Anyway, Mr. Tickles is a hell of a gun and it makes tons of damage, but it has very little range. Its good spread also makes it a very good choice when you have a lot of enemies coming at you, but if you are not close to the enemy, you want to do much damage. I think I don't need to explain you how a shotgun works, do I? It's a shotgun, like those you have always used: huge damage, wide spread and slow reload. We are afraid Mr. Tickles might be a little overpowered, so we'll have to adjust its value when we test it a little further. Also, you should know that it shoots two shells at the same time, you reload it on pairs and you'll have around 6 bullets. Not sure yet about that number, but we are still testing how it works like this. Oh, and by the way, we know it's really strange that a shotgun has two exposed hammers, but as we said with the handgun, we need that equilibrium between plausible and really, really stupid. 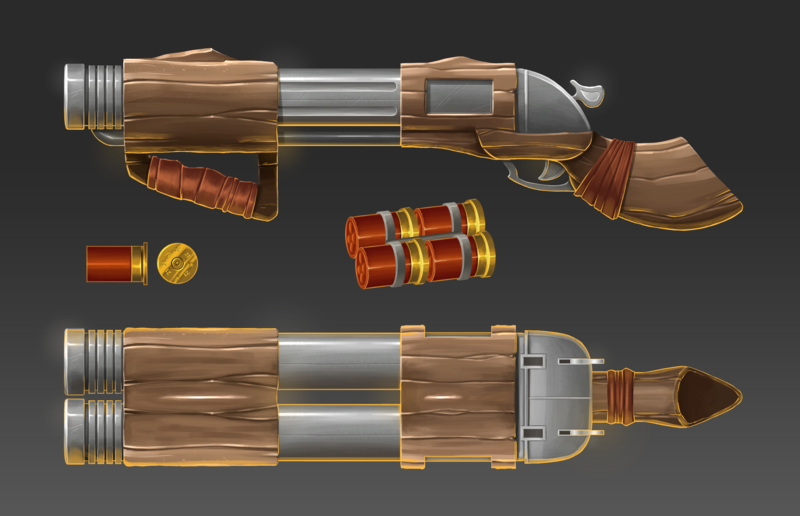 A shotgun with two barrels that uses exposed hammers to fire two shells at the same time and has wood ornaments was silly enough for us. And last, but not least, the beast of this first pack of three. I'm a poet, I know. Dina is the name the redneck gives to the dynamite sticks that the uses to blow enemies up. Since this is an arcade shooter, we didn't put much tricks into the explosives because we just want the players to grab a bundle of dynamite, point where they want to blow things up and throw it. The distance will depend on the arc you make while aiming higher or lower and also on the speed you are moving: if you run, your aceleration affects the distance. 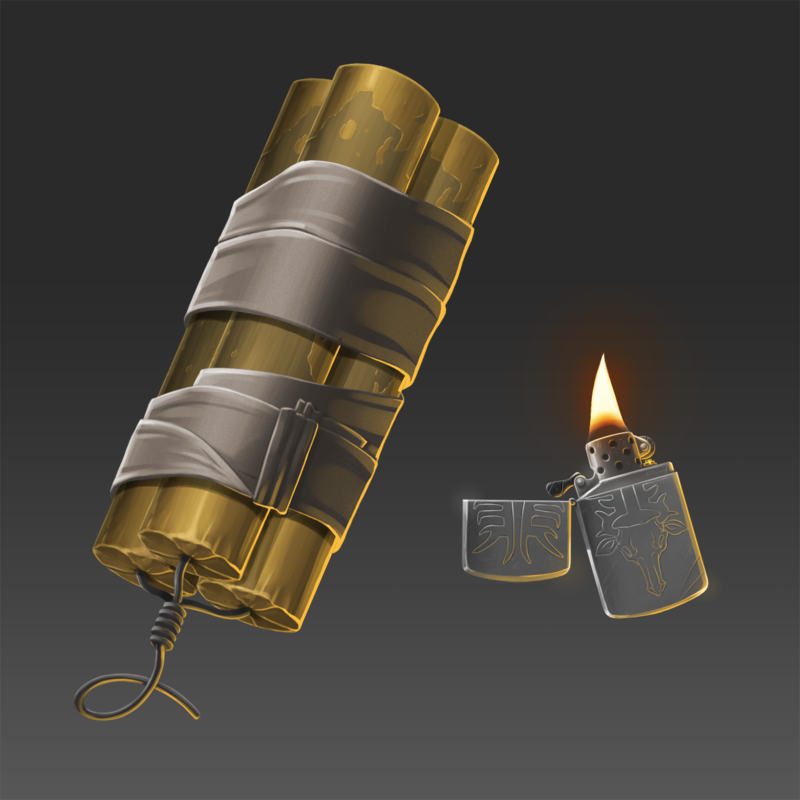 We didn't implement the possibility of the dynamite blowing up in your hand if you hold it for too long, even if that's a little unrealistic, because, again, we want an arcade vibe in the game. Also, if the dynamite hits an enemy when you throw it, it will blow up on contact. So you'll need to be careful if you have enemies near you and you use the dynamite, because you will damage yourself. If you are curious about why the dynamite is called Dina, well, it seems the redneck is a family man and he doesn't forget about his sister, Dina. She has always been a strong, impulsive girl that got into trouble constantly because of her bad temper. So in a lot of ways, she was a bomb always ready to explode. And about that lighter, it's just a souvenir he bought at the airport once he arrived in Cairo. Nope, no cool background this time. 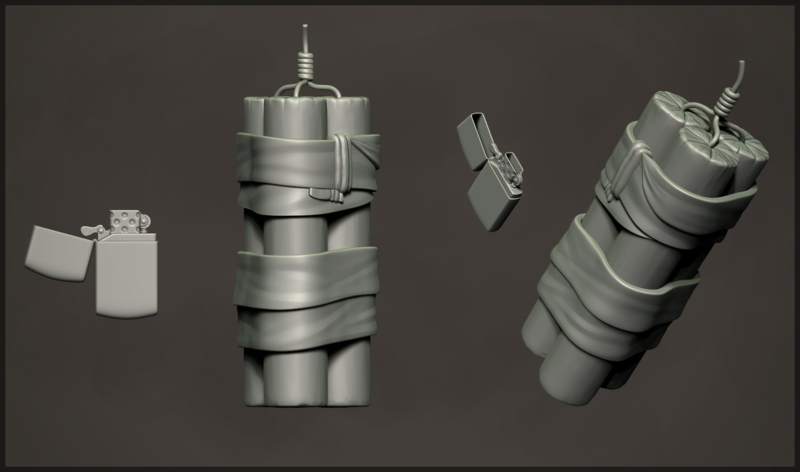 Here, a 3D model of the dynamite. Those are our first three guns. Grandpa, Mr. Tickles and Dina are the most basic guns you'll have in Immortal Redneck because they are the starter class' ones, but that doesn't mean they are not powerful. 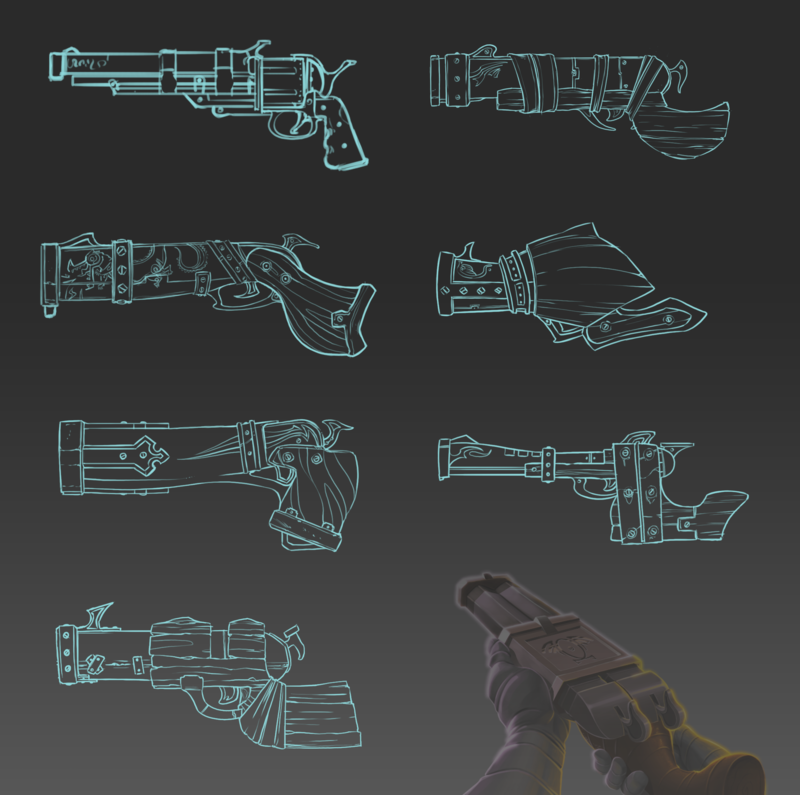 Each one of the classes in Immortal Rednack will have their own guns, but there will be others you'll grab while playing, also. The stats and the guns will affect the way you play the game, so you'll probably have favorites and you'll use different strategies depending of which one you choose in each run. And just so you don't have to imagine what we are trying to do, look at this artwork. How much would you like an electrified whip in a FPS? 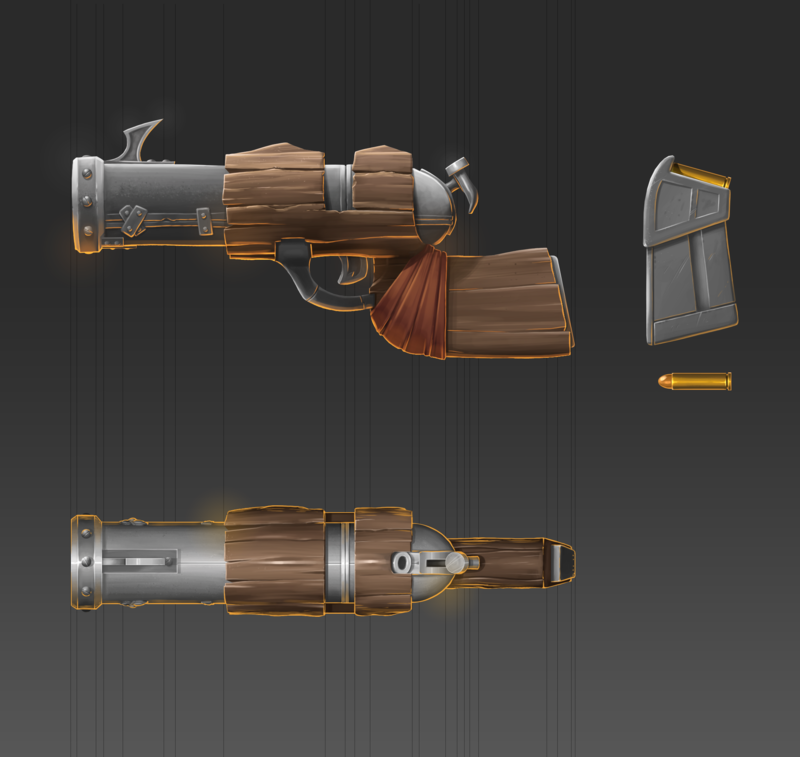 We have great plans for future weapons and we are eager to show you every one of them, but for know just understand that we need to develop them. 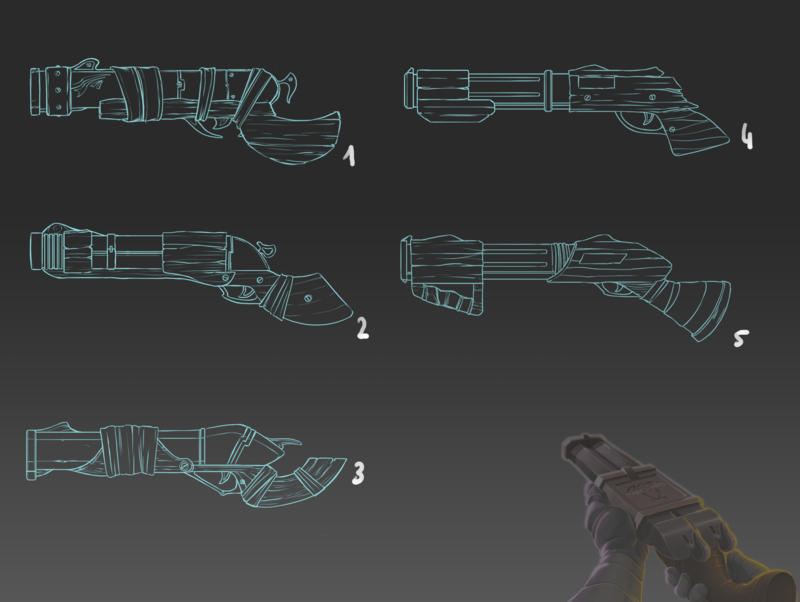 Working on them was fun because we had some differences about stupid details, like the size of the extractor of the handgun being to small for a bullet or the hammers of the shotgun being to slow or desynchonized with the rest of the animation, but those are little things we ended up solving fast. Our designers, programmer and 3D artists are very talented and polite, so they only had a tiny bloodshed. We hope you liked our three first 'children' and you enjoyed reading about their creation process and background. And remember, if you like our game, follow us on Twitter and Facebook to keep up with our new devlogs and silly comments. The game is out, download it for free on iOS, Android and Ouya. I bring you the square animals you need to rescue in the game. I'm happy to show you some of the interfaces we've been working on Oh My Goat.